Duncan Murdoch is a Professor of statistics at the University of Western Ontario in Canada; click here for information on his professional work. He says: This page is for my after-hours work: I am also an amateur (and sometimes professional) programmer, and have written a large number of freeware and shareware programs. I tend to write programs for my own use first; if I think other people might like them, then I'll polish them up a bit and either give them away or sell them. 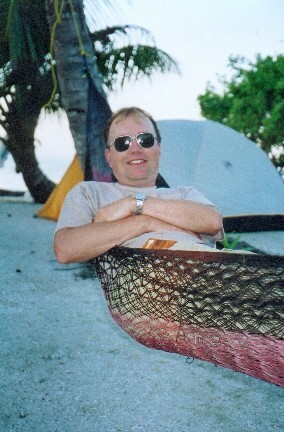 The picture on the left is from a trip I took to Belize in 2002. I went again several times; I recommend it! How to maintain multiple network configurations under Windows XP. A bug in Microsoft critical update KB835732 for Windows XP means HOMEPATH is sometimes not set. Some instructions for setting up a connection from Windows XP to a MySQL database using ODBC over an ssh tunnel. How to display a window in an MDI application. Last updated February 2009; please send comments to webmaster@murdoch-sutherland.com. Do not use this email address for bulk email of any kind; bulk email is a theft of services, because it forces the recipient to pay to receive advertising.